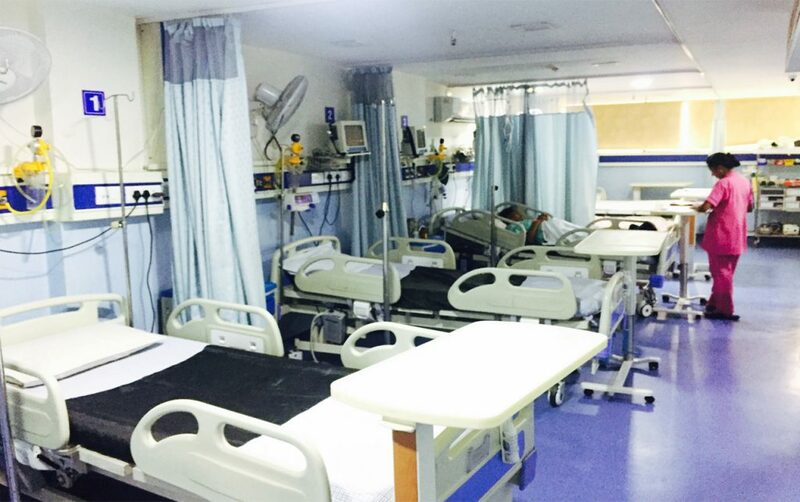 Intensive Care Unit: The special department of Makkar Multispeciality Hospital which provides intensive treatment facility with Advanced technology, bedside monitoring facilities, improved staffing efficiencies, and a secured environment are just a few of the many features you’ll find in our Intensive Care Unit. Makkar Multispeciality Hospital is one of the Best Pediatric ICU Hospitals in Delhi, India. Our best Pediatric Doctors cater to a wide range of childhood problems. Makkar Multispeciality Hospital is the only intensive care unit in Laxmi Nagar, Delhi specifically for children, adults, and people of every age with all facilities required as per the age group. Unique to our unit is a dedicated staff of critical care specialist doctors who provide in-hospital coverage 24 hours a day. Patients treated for cardiac and trauma states are routinely treated in the unit. For more information about the Intensive Care Unit, call (011 2246 2221). What is the ICU (Intensive Care Unit) in Makkar Multispeciality hospital? 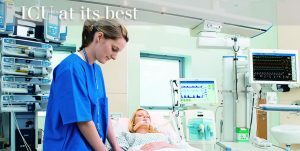 The Intensive Care Unit (ICU) is a unit in the Makkar Multispeciality hospital where critically ill patients are treated by specifically trained staff. The ICU staff includes doctors, attendants, respiratory therapists, clinical nurse experts, pharmacists, physical therapists, nurse practitioners, physician assistants, dietitians, social workers, and specialists. Care in the ICU varies from other hospital units and departments. Critically ill patients require close observation and monitoring. Specially trained nurses care for an individual or two patients at a time, each shift. ICU specialists are specifically trained critical care doctors.Patients may have specialized equipment in their room, depending on their situation and condition. The equipment in the ICU may seem overwhelming. Patients are attached to machines to monitor their heart, blood pressure, and respiratory rate. Ventilators (Breathing Machines) support some patients with breathing until they can breathe on their own. We suggest that visitors be confined to two at one time for patients in the ICU. You are advised to stay in the patient’s room during your visit. If you are asked to wait outside of the patient room, kindly return to the waiting section out of respect for other patient’s privacy. Visitors will be directed by the ICU staff to leave for short periods during doctor’s rounds, nurses’ report, certain methods, and emergencies. Doctor’s rounds generally occur during the morning, early evening, and at midnight. Due to patient privacy concerns and the proximity of our patient rooms to each other, visitors will be asked to leave the unit seldom when doctors are rounding on their patients or the patients on both sides of the patient they are visiting. Visiting may continue once the team is at least two doors apart from the patient. Visitors are informed not to visit when they have possibly infectious conditions (for example respiratory infections – “colds”). Patients are treated in ICU for a variety of reasons. Some patients need close monitoring immediately after a major surgical operation or severe head injury. Others may have difficulties with their lungs that require ventilator support with breathing. Patients may have heart and blood vessel concerns (for exa mple, a heart attack, very low or very high blood pressure, or an unstable heart rhythm) requiring observation. Patients in the ICU may have an unevenness in the level of chemicals, salts, or minerals in their bloodstream that needs close monitoring as these levels are improved. Also, patients may have a severe infection in their body that require specific ICU care. What Can a Patient or as a Family Member of a Patient Expect in the ICU of Makkar Multispeciality Hospital? You can expect that anyone from the team of ICU will keep you updated on any significant variations in the patient’s health status or procedures that are being implemented. You can expect to speak with a doctor on a routine basis. Member of the ICU team meets with the patient or family member to make sure that everyone has a common understanding of the patient’s health condition and the plan of care. During these meetings, it is a suitable time for family members to ask any questions to the health care team or Intensive care unit team. It is important to know that even though modern medicine has come a long way over the past 50 years, not all diseases can be healed or cured. Patients may be assigned to the ICU because there is a chance they may not survive without intensive care treatment. And sometimes, despite the use of advanced technology and specially trained team, doctors may not be able to change the dying process. Because patients in the ICU may be seriously ill, they may be unable to speak on their part. In these cases, the doctors and nurses may ask the family what the patient’s situation would want to be done if their heart or lungs fail. There are moments when the doctors may suggest against the use of life support machines and treatments.